A group of five (5) yacting photographs a group of five  albumen prints [not mounted] of various sailing yachts, each with the title and number in the negative: THISTLE in drydock, DEFENDER (1895 AC winner), EL HEIRIE, QUI VIVE, AL-ANKA. Each in good condition.6-1/2 x 8-1/4 in. (16.5 x 21.1 cm.) each with slight variations. DEFENDER BREAKS DOWN; Snapped a Hollow Gaff in Goelet Cup Races. VIGILANT THEN SECURED THE PRIZE Defender Was Well Ahead When the Accident Happened and Would Have Won. JUBILEE BEATEN BY THE VIGILANT The Cup Defender Again Shows Her Superiority. NEWPORT, R.I., Aug. 2. 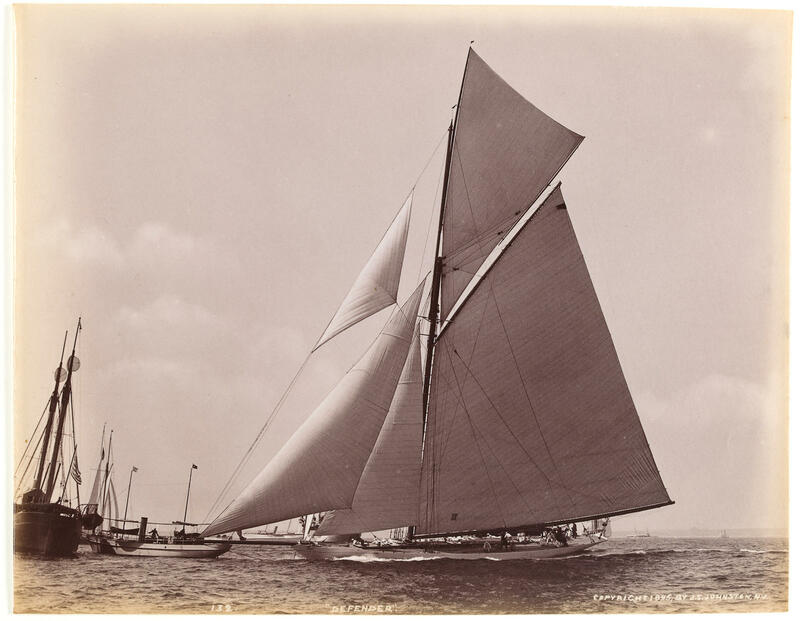 -- George J. Gould has won a Goelet cup with his yacht Vigilant. She was in luck to-day, and won the much-coveted trophy through the Defender's breaking down. The Defender had led all around the course, and was only five miles from the finish when her gaff snapped just about the middle of the spar, and she was put out of the race.